Contrary to my wishes, the elephant ear kalanchoe (having Latin names as a common name can be incredibly confusing; Kalanchoe refers to the genus, kalanchoe refers to any plant that looks like it belongs to the genus, whether it does or not) is native to Madagascar. Based on the shape of the leaves, I figured that they looked more like an Asian elephant than an African elephant, and so I wanted badly for this plant to be native to India. Not so. Ah, well. This species of Kalanchoe was once widely distributed across the entire island of Madagascar, but now exists only in small areas (but in those small areas it is still very abundant). It has been introduced to many areas around the world including Mexico, South Africa, and the Himalayas where it has been naturalized and exists as an integral part of their arid, desert ecosystems. This plant is a succulent, meaning it is drought-tolerant and stores water in its leaves for use during times when water is not readily available. Succulents actually do better when you let the soil dry out completely between waterings, and over-watering is the leading cause of death of indoor succulents (that sounded very coroner-like...). In fact, if you are prone to neglecting house plants, this plant is definitely for you; it can survive for two weeks during the height of summer with no water, and at least two months during the winter! 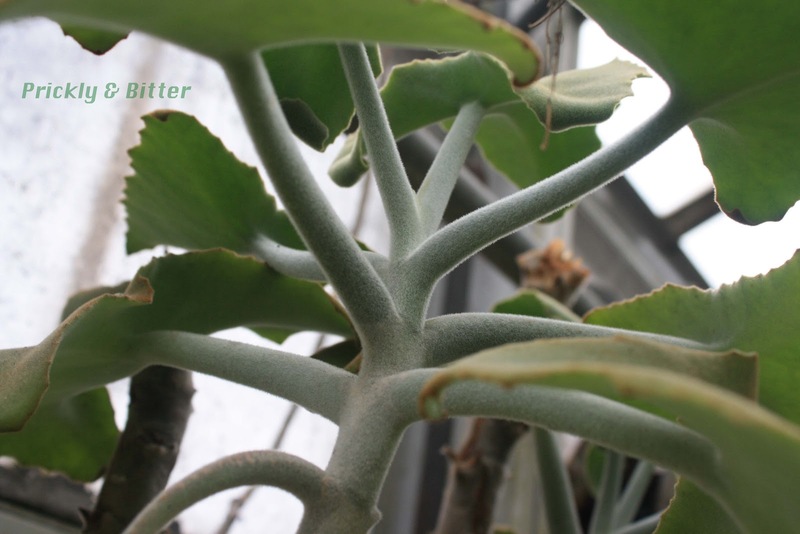 Different species of Kalanchoe are known not for their foliage or for their flowers, but for their method of reproduction. Unfortunately, this species also didn't read the book about rules kalanchoes have to follow so it very rarely reproduces this way. 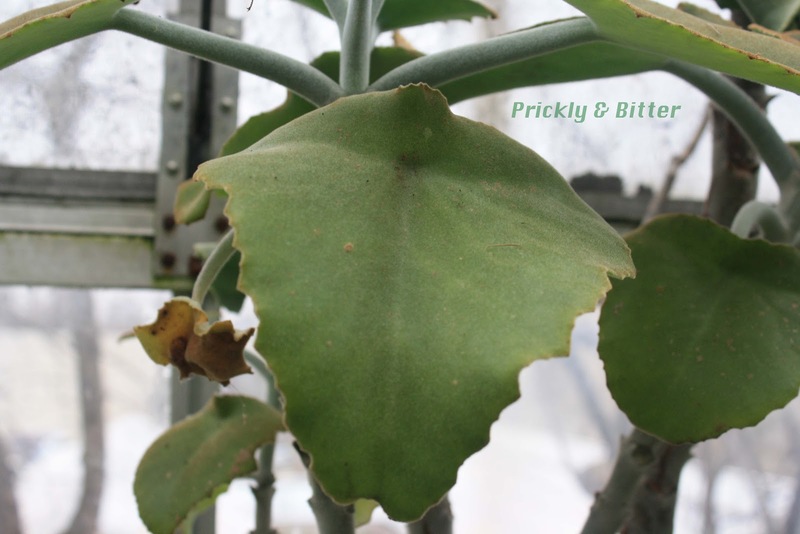 Most kalanchoes produce structures called foliar embryos at the edges of their leaves, in the indentations or margin waves. These foliar embryos are produced asexually (they are clones of the parent plant), and develop on the edge of the leaf using resources from the parent plant until it is ready to grow on its own. Depending on how much water is around, this could even be until the embryo has four or five fully-developed leaves and a handful of roots. It's quite a spectacle to see, and I'll profile another species of Kalanchoe another time that produces spectacular amounts of these foliar embryos. They are often sold in nurseries and greenhouses, which I never understood. Why buy the plant if you can get the embryos for free?! 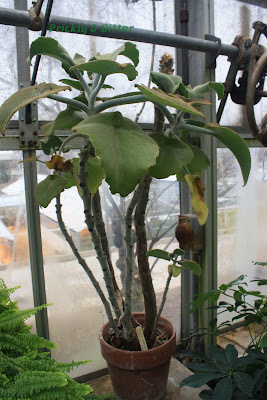 I'll admit, guilty as charged--that's how I obtained my Kalanchoe that we had in a south-facing window until we moved. Various species of Kalanchoe can reach heights of up to 12 meters, and regularly grow indoors to 6 feet or more if given a big enough pot. Even in a 6" pot, my kalanchoe was enormous, and produced so many embryos they would regularly be all over the carpet. If you want a clean houseplant, this one is not for you! The dense surface hairs on the leaves and upper stem of these plants serve two purposes. The first is a method of decreasing water loss from the leaf of the plant. The hairs create a micro-climate at the leaf's surface that is humid and warm, ensuring that any water around the leaf condenses on the hairs and can be used by the plant. Creating a leaf micro-climate is common of succulent and other desert species since losing too much water from your leaves will definitely lead to the death of the plant in such a harsh climate. The second reason for the leaf hairs is to serve as a defence system for the plant. Since the leaf tissues are so juicy, any herbivore looking for food and water would target succulent plants first. They cannot afford to be eaten, so they produce surface hairs that are more like spines or daggers to a small insect. This is actually incredibly effective; if you mutate the genes responsible for producing surface hairs on the leaves, the plant is completely consumed by insects and other small herbivores (and even some big ones like omnivorous lizards). The surface hairs themselves deter about 95% of all predators, and the additional chemical they pack into the hairs deters the rest: silica. If you've ever had an accidental mouthful of sand, you'll understand why nothing would ever want to eat these plants!